Kimberley Alpine Resort is every beginners dream, and it is ideal for family fun with all the kids. Confident intermediary and advance skiers and snow boarders will most likely get bored after a few days. The green and blue runs are wide, long and not challenging. There are a few nice blacks but only three very short double diamonds. There are four mountain faces in Kimberley Alpine Resort: NorthStar Mountain, Tamarack Ridge, Vimy Ridge and Black Forest. These are serviced by three lifts: North Star Quad, Easter and Tamarack. 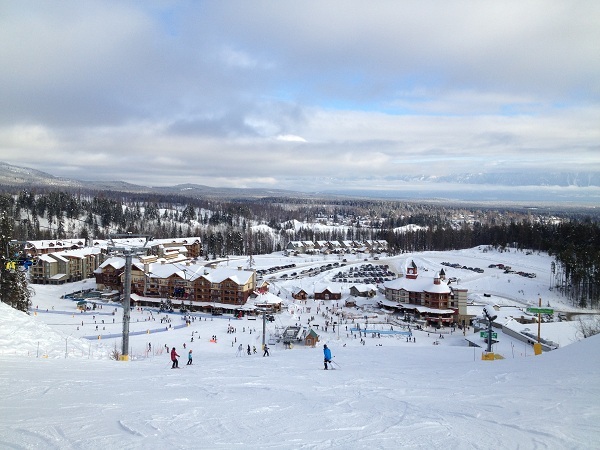 Kimberley Alpine Resort is only about 40 min from Cranbrook, in south east British Columbia. The North Star Quad running through the centre of NorthStar Mountain is the fastest and longest lift in Kimberley Alpine Resort. This part of the Mountain has mostly blue and green runs. I wish I had come to Kimberley Alpine Resort on my first trip, it must be an absolute pleasure to learn to ski or snowboard on these wide-open runs on NorthStar Mountain. They are also nice and long, giving you lots of time to practice before getting back on the high-speed lift again. These runs are also relatively flat and quiet. There were very few people when we visited in early January. All three the double diamond runs in Kimberley Alpine Resort is located on NorthStar Mountain, they are: Jack the Bear, White Pine and Robinson’s Ridge. Tamarack Ridge is more of a challenge. About 90% of the runs are black, with only a few green and blue runs, mostly going across the face of the ridge. The Tamarack Double Chair is a very old and slow lift starting at the very bottom of Tamarack Ridge. There are few longer and more challenging blacks on Tamarack Ridge: Good Luck, Tamarack, Tusk and Upshot. Vimy Ridge is the smallest of the mountain faces at Kimberley Alpine Resort. There are 10 runs, three of them are nice fast blacks leading to the bottom of Easter Triple Chair. They are: Flapper, Fuzzy and Flash. 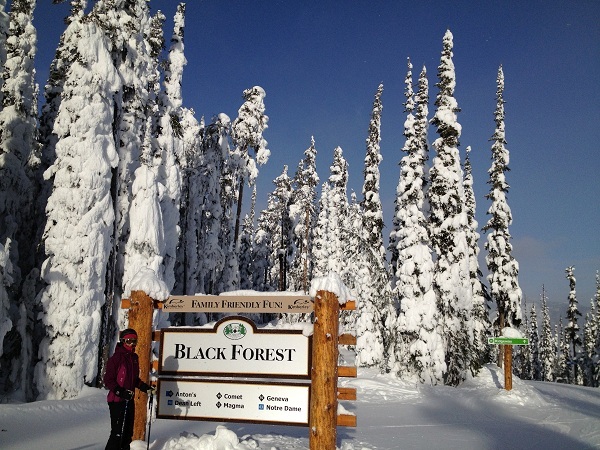 My favourite part of Kimberley Alpine Resort is Black Forrest. It has a bunch of steep black runs all through the trees. There are some great parts for glade skiing and having fun. The biggest problem is to get back to the top you have to ride the two slower lifts in the resort: Tamarack Double Chair followed by Easter Triple Chair. The resort is entirely below the tree line, so it must be a great place to be on days when visibility is very bad. I am looking forward to visiting it with the kids. This entry was posted in Ski Resorts, Sports on 2013/01/19 by Justinus.